Mari Batterton was born in Manila, Philippines. She has been living in Japan eight years, the last two of them on Okinawa, and is quick to say that Okinawa is a paradise compared to the rest of Japan. “This place is totally different, just awesome,” she says. 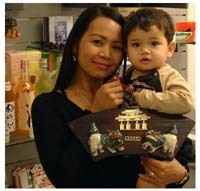 She also had the fortune to meet her husband here, get married and had a baby boy. Her favorite food is Okinawa soba, and the favorite places the numerous beaches around the island. 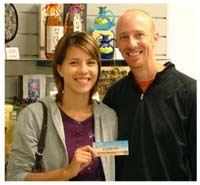 She won a shisa decoration plate courtesy of Okinawa Market.